Once inside, the host displays all kinds of interesting and bizarre graves belonging to Hollywood’s elite. Truman Capote is buried here, right next to best friend Joanne Carson, ex-wife of Johnny. Remember Walter Matthau and Jack Lemmon from 1968’s The Odd Couple and other films? They’re both at Westwood now, though not in adjacent graves. Oddities abound. The grave of Roy Orbison is unmarked, but Don Knotts has an elaborate headstone depicting some of his most famous roles. Rodney Dangerfield has a joke (“There Goes The Neighborhood”) on his marker. For some arcane reason, pinup queen Bettie Page will spend eternity next door to Allan Melvin, voice of Magilla Gorilla. 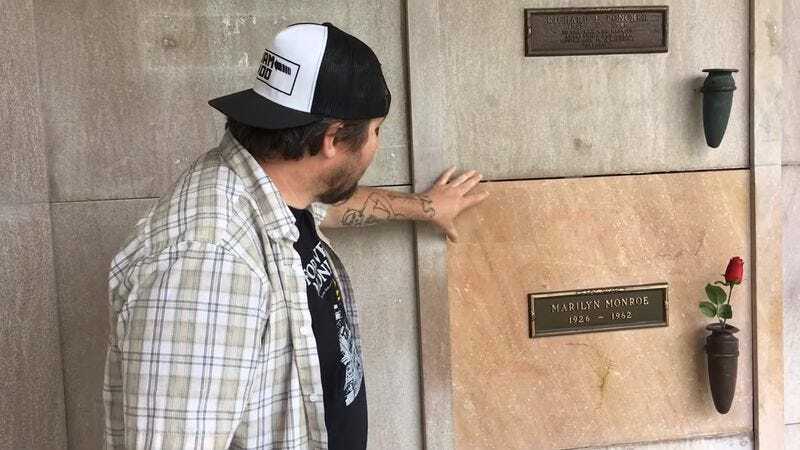 Monroe’s grave, naturally, is the main attraction at Westwood and the subject of numerous urban legends. So many fans have smeared lipstick on her grave that it is permanently stained. The video actually captures a lonely cemetery employee dutifully cleaning Monroe’s final resting place. It’s all part of the routine at this strange place.